I should have known what kind of trip it was going to be from the moment I left my apartment. It began last Thursday around midnight, when I was all packed and ready to jump on 12-hour overnight bus trip across Spain. I was looking forward to sleeping off the previous night’s discoteca outing that lasted until 4 a.m. And I was really excited to see some of the most amazing historical sites in beautiful old Spanish cities. I said bye to my roommate “But you forgot something important!” he shouted as I was leaving. “But my nap! !” He just laughed. Setting off to go here! Within half an hour, I was on Bus #1 with a new friend who kindly helped me out with my booze oversight. 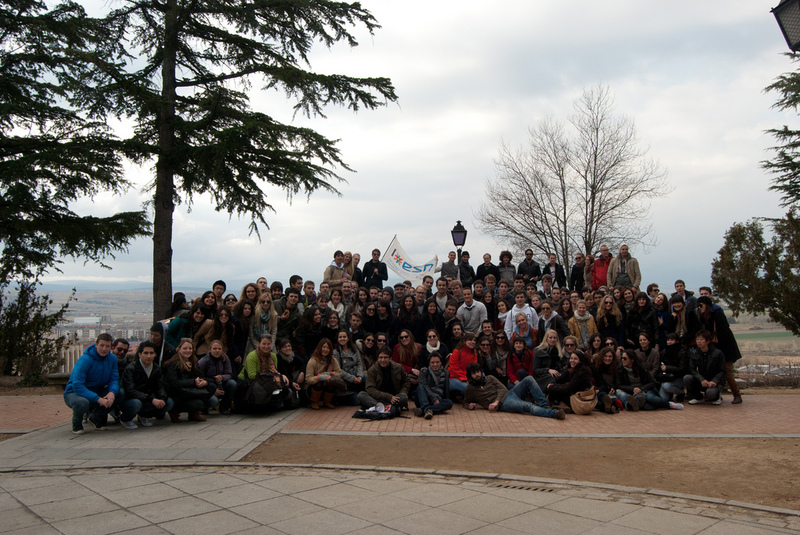 It was packed with sixty party-happy 20-somethings from all over the world. Then out came the karaoke on the bus’s T.V. Cue sixty now tipsy 20-somethings singing and dancing in the aisles with coordinated hip thrusts to “Ai Se Eu Te Pego“. It’s pretty much obligatory to know the dance if you’re in Spain at the moment. As made famous by this guy ( Cristiano Ronaldo). Eventually it calmed down and people fell asleep. I woke hours later up to miles of beautiful Spanish countryside, with gently rolling hills and pretty stone walls dotted across the fields. We got sleepily rolled out of the bus in Ávila half an hour later. We walked through the amazing castle walls to the Plaza Mayor, where there was a Friday morning farmers’ market filled with old Spanish couples. The men lined up for olives and the women picked out vegetables. First stop was breakfast. I went with a new Finnish friend from the bus, and we ate sandwiches at a lovely local bar filled with jamón legs and beautiful tapas. She had a tasty Spanish tortilla sandwich, and I tried jamón and cheese. The sandwiches were on the most amazing bread and bigger than my upper arm. 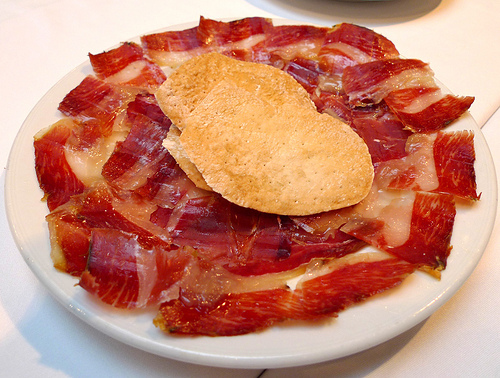 This was actually the first time I’ve eaten the famous Spanish jamón and enjoyed it. Neither of us finished! Sadly I forgot to take pictures. The closed door in question. 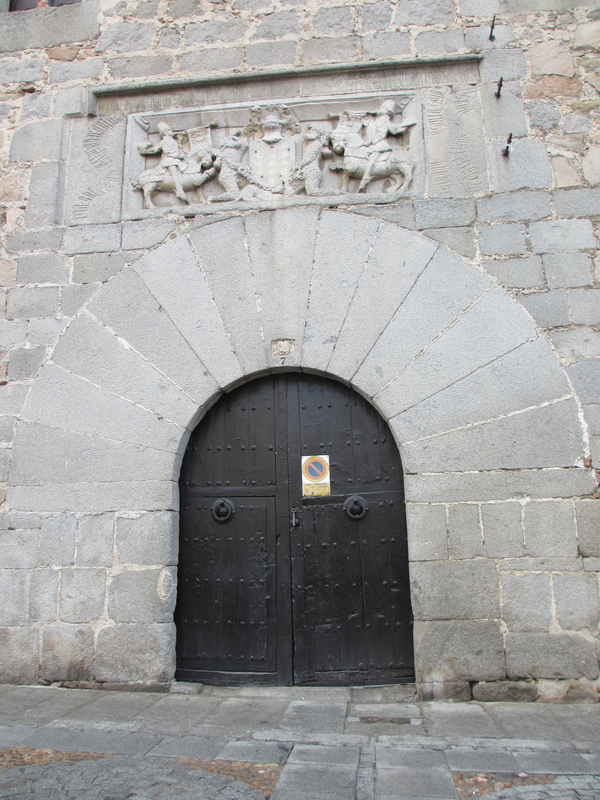 We made our way through the winding cobblestoned streets, and it was easy to see why they call Ávila “The City of Pebbles and Saints.” There was a church on practically every corner! Then we saw a few more of the churches and sights, like the Convento de Santa Teresa. 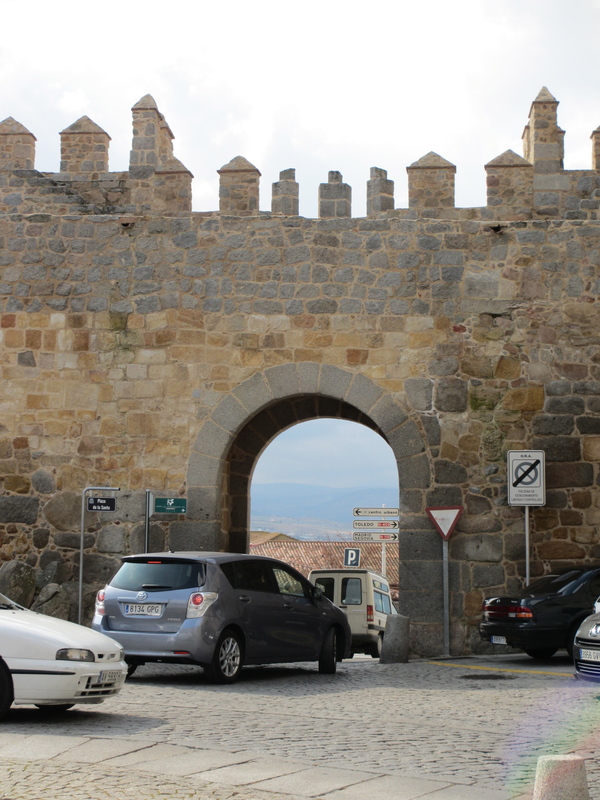 I loved seeing the old castle walls jammed up next to modern things, like when cars passed through the old archways. All the people who grew up in Europe were pretty unimpressed, but stuff like this just doesn’t exist in California! 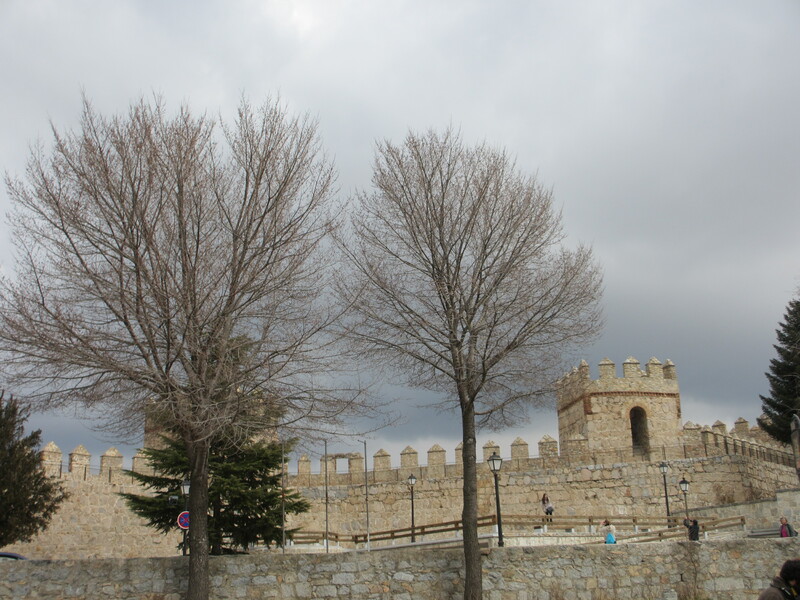 The walls date back to the 11th century and circle the old part of the city. To give you an idea of how big they are, Wikipedia says it’s got 88 towers and the walls are 2,516 meters long. Our tour guide told us they get lit up at night and it’s the biggest lit up monument in the world. I wish we’d gotten to see them at night! Our tour was pretty short, and it was realllly hard to hear because there were so many of us and one person doing her best to be heard. 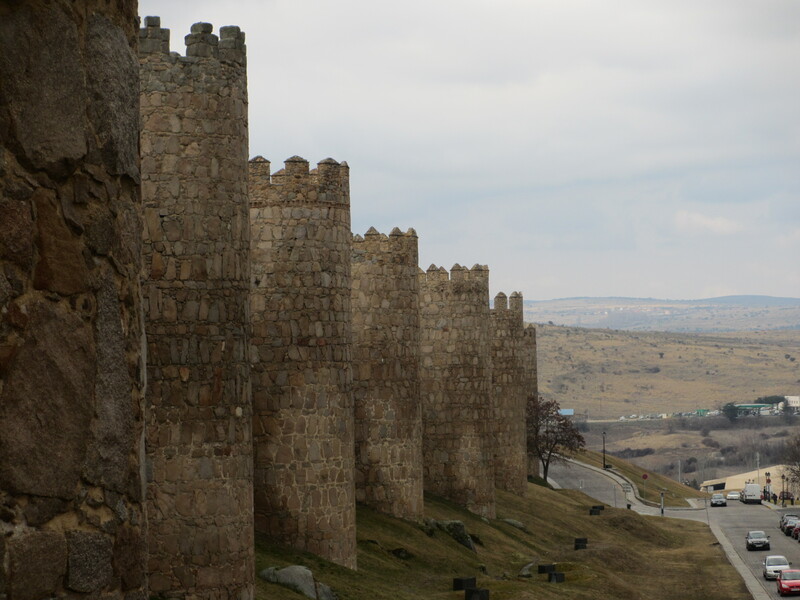 So unfortunately, I don’t have much more of the history and background of Ávila! 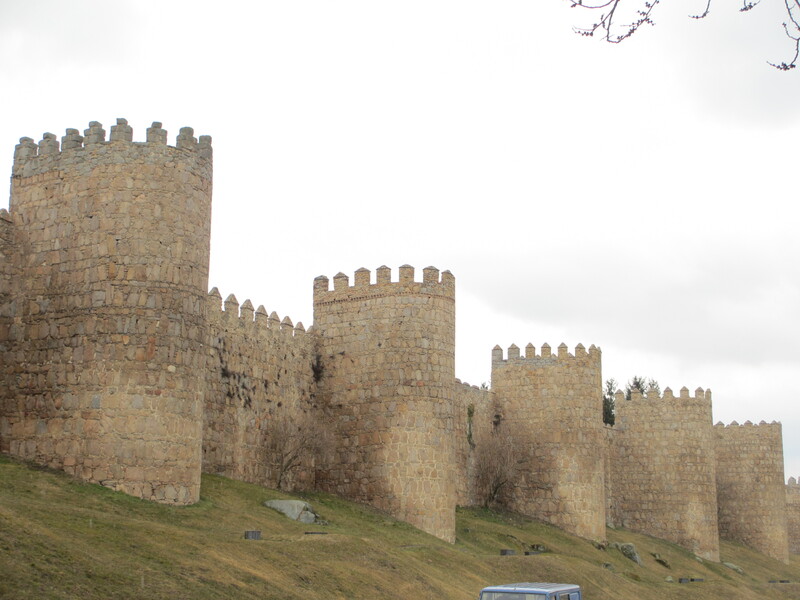 Just as it started to rain, we left through the beautiful walls before making our way to Salamanca. PreviousTravel Plans – Valencia, Sevilla, Ibiza, & Beyond! Next¿Cómo se dice “Daylight Savings Time”? How cool! I love walking through farmer’s markets- especially in the countryside! Yeah, they always have fun stuff to look at. Your trip looks amazing! If I ever find myself in the area, I’ll have to check out Avila. You should, it’s really beautiful! 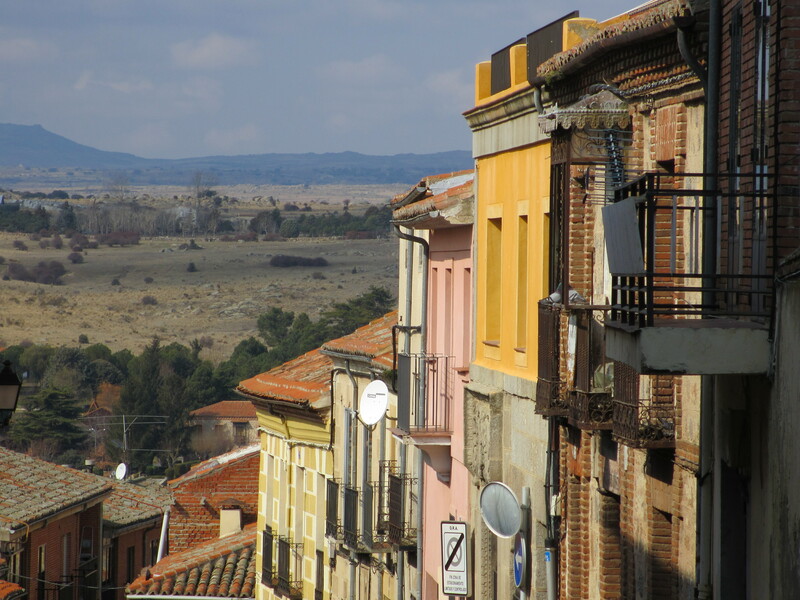 It’s not too far from Madrid and really cool. I haven’t been back to Avila since the only time I went back in 2004! However I am pretty sure you loved Salamanca. It is so beautiful and also full of students because of the university there so lots of places to go out and party. I just went for a day trip and then went back for Semana Santa with my parents. The first time I went I spent the full day there so I got to see the Plaza Mayor lit up at night and the most beautiful sunset. Can’t wait to see your pictures! Yeah, I definitely loved Salamanca. You should go back and see the student life too, it’s really fun. I’ll post about it later this week – I had wayyy too many pictures to do a single post about my trip! Oohh so pretty! I love the houses on the hill. Such beautiful architecture. It’s definitely a beautiful place. Thanks for stopping by!